Today is a sad day at Unscripted Sketches. This is our last challenge. We are closing the Unscripted Sketches blog. I hope you play along with or last and final challenge. Just use the sketch below. My son is getting married in Hawaii in July and his fiancé had a bridal shower and I made this card as the gifts were to be for their home, their deck that they had added. So I really wanted to make the card for both. Their invitation was done on kraft and looked really cool so kind of stuck with the kraft look of a card and just used the sketch above to bring it together. Well it's the end of May.. Where did the month go. I know I say that ever month but it's true every month. Time just keep going by so fast. This is the card I made using the recipe challenge above. 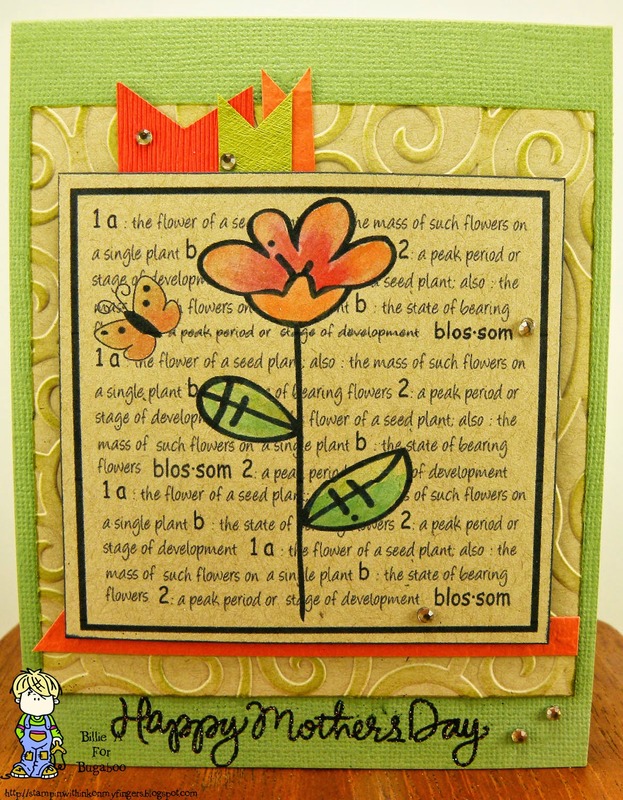 I folder embossed the kraft background and powder embossed the sentiment Happy Mothers Day. I printed the image / blossom word block onto the kraft. I used orange as my pop of color. I know mothers day is behind us but I have a card for next year and I have people who need them. I am loving the pop of orange and doing the digi on kraft. I will have to remember to use kraft more often for my digi's. 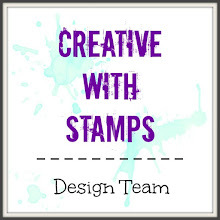 Our sponsor this challenge#107 is Stamp Art Design by Kathryne. I got to use the awesome image Katie. 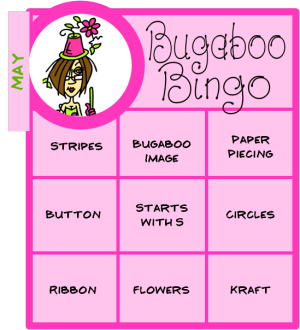 The above BINGO is what you will use to play in this challenge at Aud Sentiments #107. I chose to use the row with DIE CUT / 4 WORDS / RIBBON... pretty simple huh. 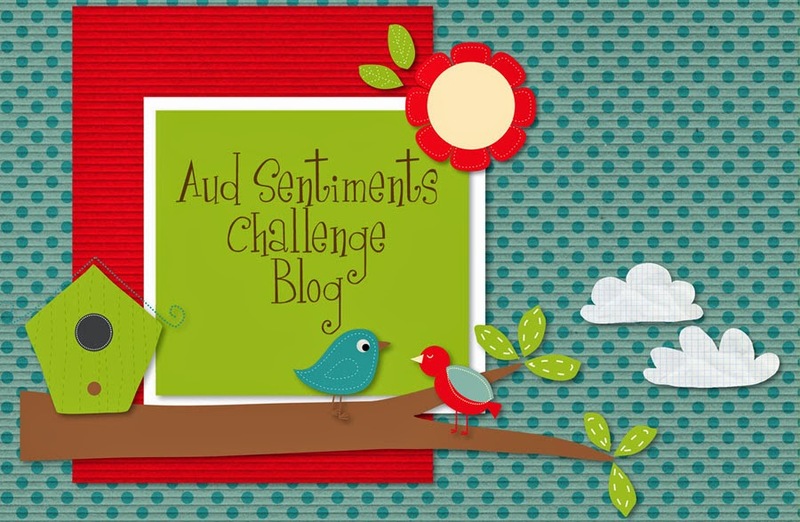 You can do it too and make your card using any three in a row and enter your card at the Aud Sentiments blog. Just make sure your sentiment is on the front of your card.. Now come on and play along. I hope I inspired you. recipe: Katie/stampart by Kathryn, su base, scraps, ribbon, su die, 1/2 pearls want 2 scrap, copics, wink of stella glitter pen, emb folder, ss like your style sentiments. 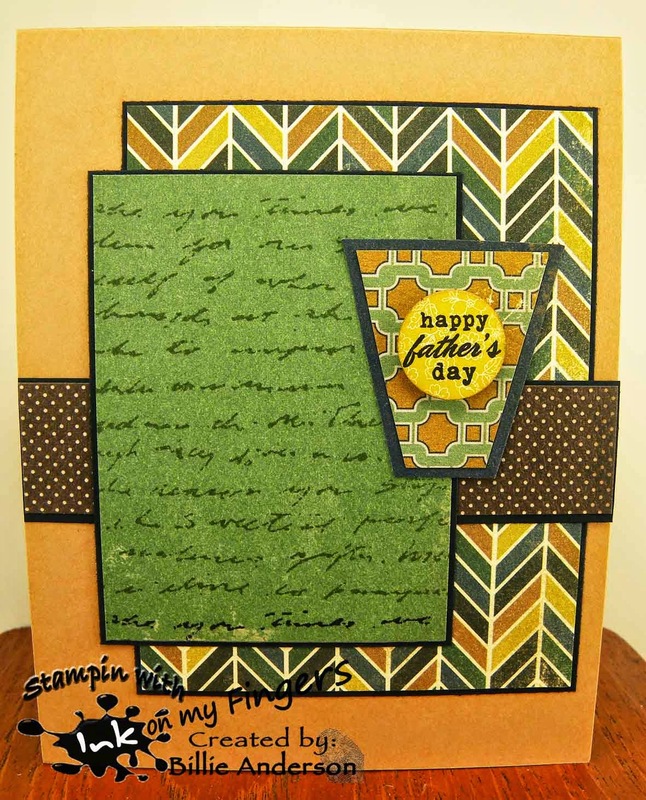 today we have the theme of Fathers Day.. yup it's almost here and time to get those cards made so here is the perfect time to make your card and post it to the Paper Pretties Fathers Day challenge blog. I use the clear rubber stamp set from Paper Pretties Right on Par I had this great left over paper from Quick quote with the rulers on it, and I used a piece of thin washi tape along the black to give a different look. 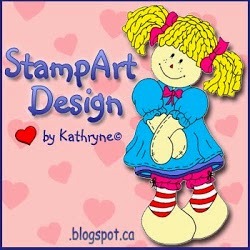 I am loving those glossy hearts that I used from Simon Says stamps. I really like this card. Yea there are cards I make that I don't care for.. I am sure you have made those too. Seems funny those are some of the cards I win on other blogs for challenges I enter.. funny. 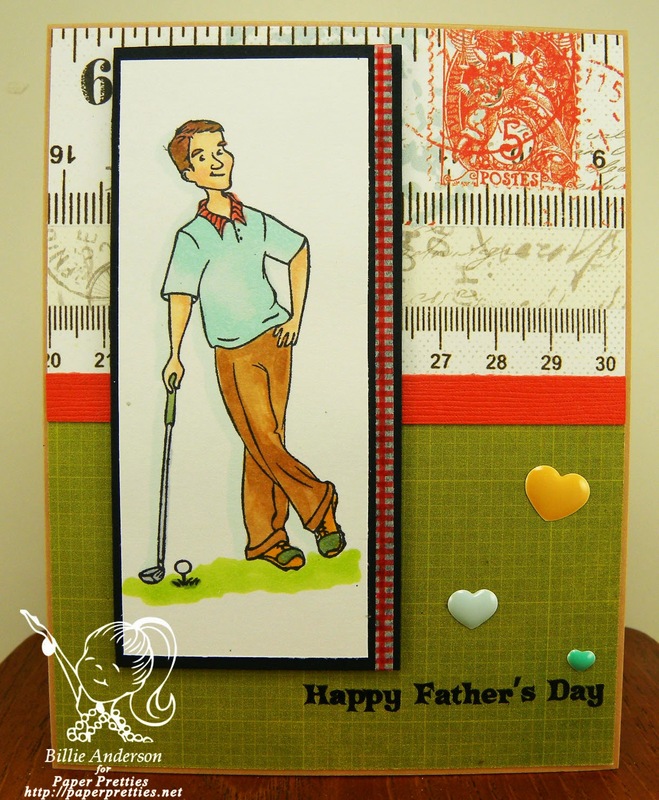 I know my dad did not golf but I do know fathers who do and even if they don't it's an awesome masculine fathers day card to give. My father and FIL are no longer with us but know other fathers who would love to receive this card. 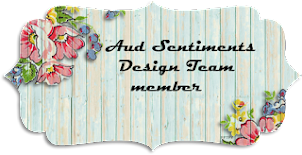 I hope you get a chance to play along and post your card over at Paper Pretties. 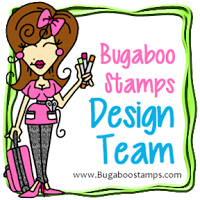 You could win some free digi stamps.. who doesn't like that.. It's Tuesday and so that means New Release at Catch the bug / Cherries Again, Jodie of Bugaboo/Catch the bug did an awesome new release. I love her work. I tried to make my cherries look like the Rainier brand of cherries. I love the Rainier cherries better than the Bing but if I only had bing I would eat them. If you have not tried the Rainier type of cherries.. give them a try. ymmm you wont be disappointed. In the mean time head to Bugaboo and check out the new releases. Hope everyone is having a great Memorial day in the USA. Thinking of those who have served or have serves our country and for the lives lost saving our country. My hearts go out to you /them all and a BIG THANK YOU. 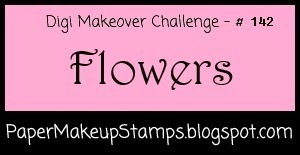 Time for a new challenge at Paper Makeover #142 - FLOWERS.. Hope you get a chance to play along and post your card over at our Paper makeover blog. 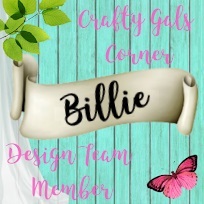 This is the card I made using the image from digi makeover. I love the look. I used my cloud template to give a great background to the silhouette flowers. 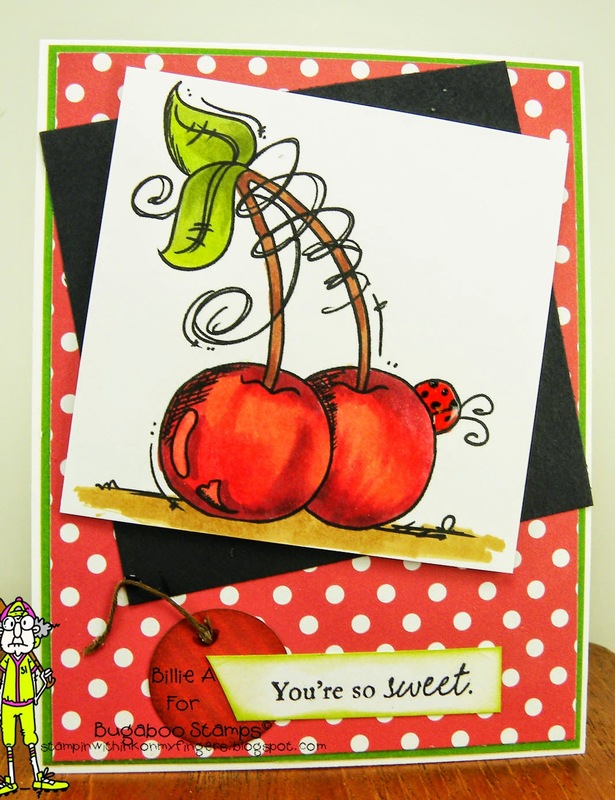 I chose this awesome flower dp on the bottom part of the card and added a ribbon. The sentiment is always a fun one to use. 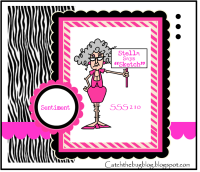 I hope my card inspires you to play along over at the Paper Makeover blog. Just remember to use digi flowers. recipe: fhl 1&2 pmo image, words gina k botanicals, dcwv, su base, rhinestones, ribbon, ranger blue, cloud template, club scrap, hero art black. 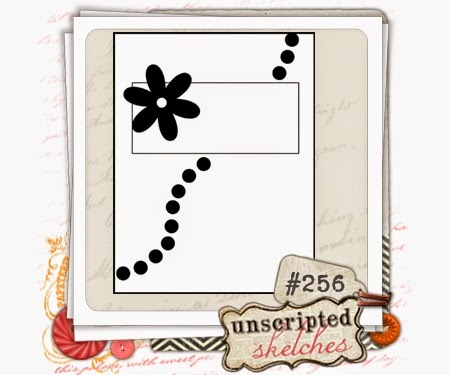 Use the below sketch to make your card, scrapbook page or some project. Have fun and play along. This is the card I made using the above sketch. 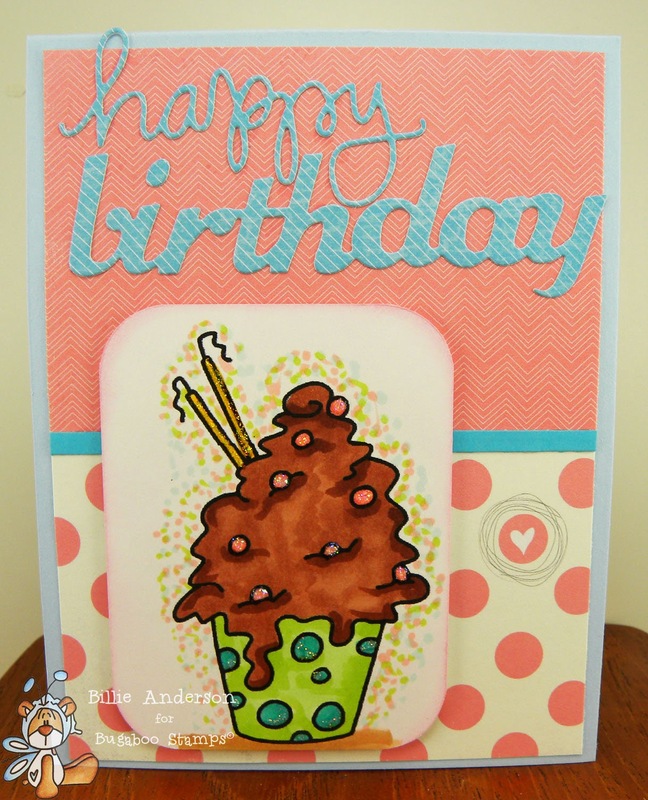 I am in love with this card, I love the colors, the simple look and just over all way it came out. I wish my father was still around to give this card to but sadly that wont happen. But it will be nice to know someone else will use this card for their special dad in their lives. I hope this sketch and my card inspires you to play along. Saturday at Catch the bug is new challenge Saturday. We have the below photo inspiration. Let's see what you come up with. This is the card I came up with using the above photo. Bugaboo image AKV bicycle Isn't he a cute little guy? I have this awesome sentiment that went perfect with the image from PTI. 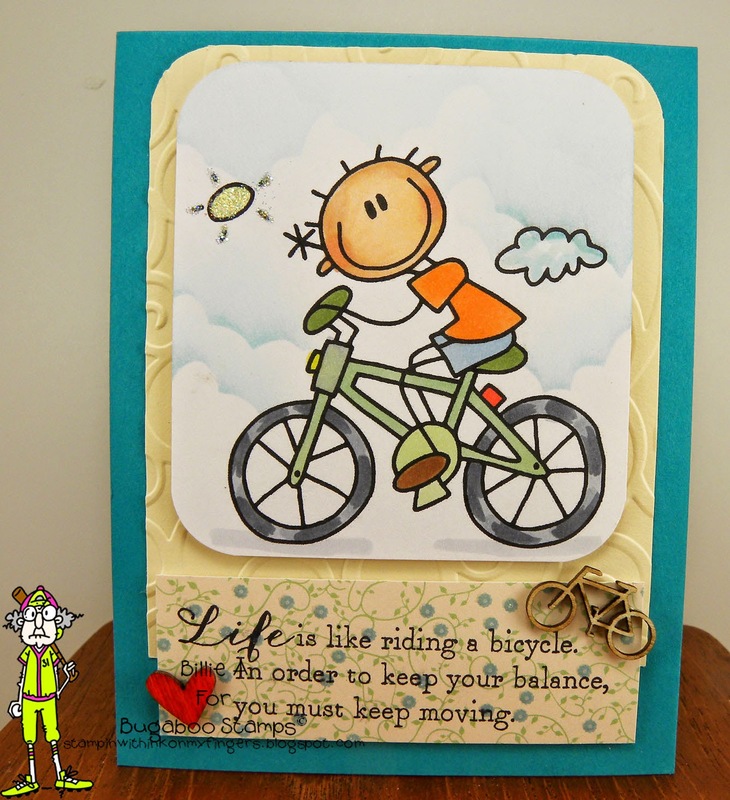 The little wooden bicycle and heart finished off the card. Yeah Friday is here and we have a long weekend in the USA - Memorial holiday so looking forward to it. Of course it's suppose to rain all weekend. : ( all week it's been nice in the 70's but for the past few weeks the weekend always comes up with raining. Oh well, it's three days no work so that's ok. I made it for a birthday card. I have three grandchildren with birthdays in June.. so sure this will go to one of them. We can never have too many birthday cards. I hope you get over to the bugaboo store and grab up this awesome digi. Well it's hump day and hope you all have had a great week so far. I chose to use an Irish blessing and love the thought of this saying. I had to read it a couple of times to get the jest of it (that's just me, thick skull) but I like that thought. I embellished it with flowers to stay with the theme. I now there are digi's with flowers in them but I liked that I could just use the sentiment and embellish instead. 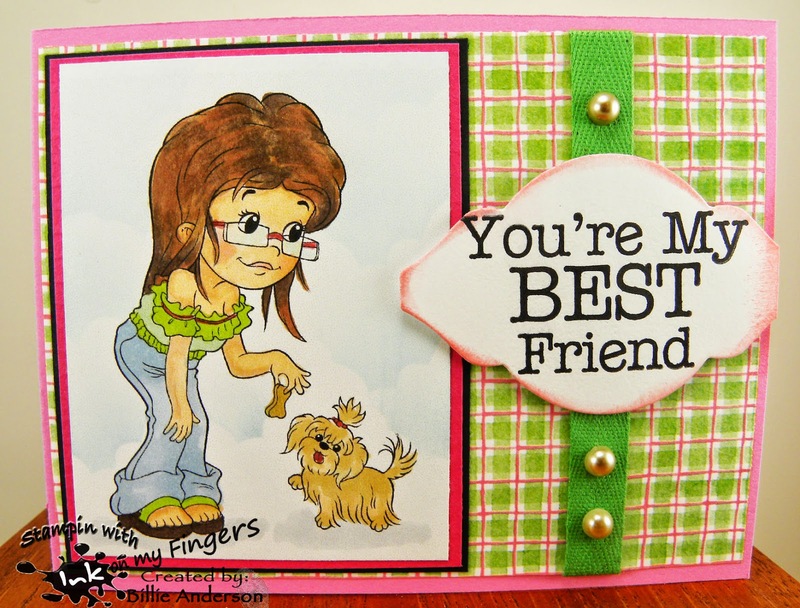 I like that this card can be to encourage someone, a birthday card, just a friendship card. The sentiment can be used for different occasions. I hope you play along and you could win some awesome digi's. 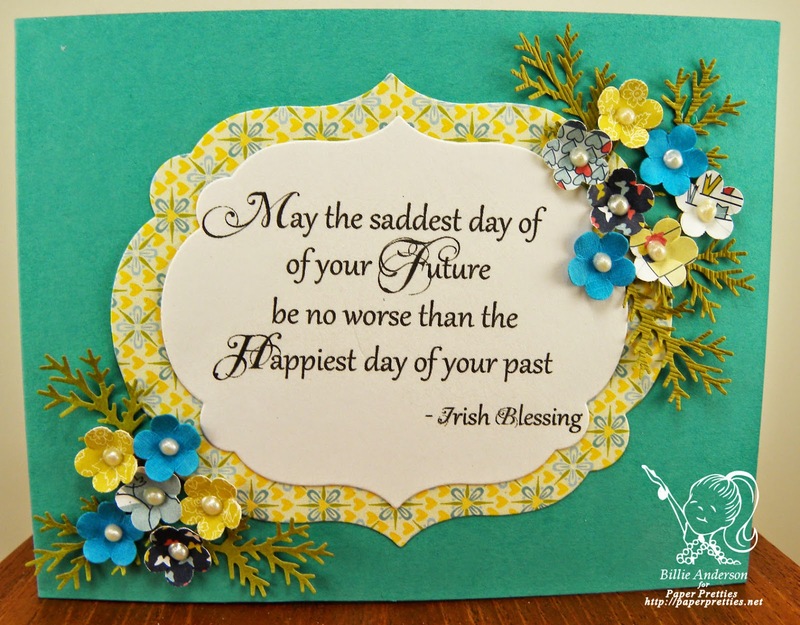 recipe: irish blessing /pp, su base, scraps, ms punch, su punch, viva pearl pen, su die. Now this is the way to start my day. A nice big cup of coffee. 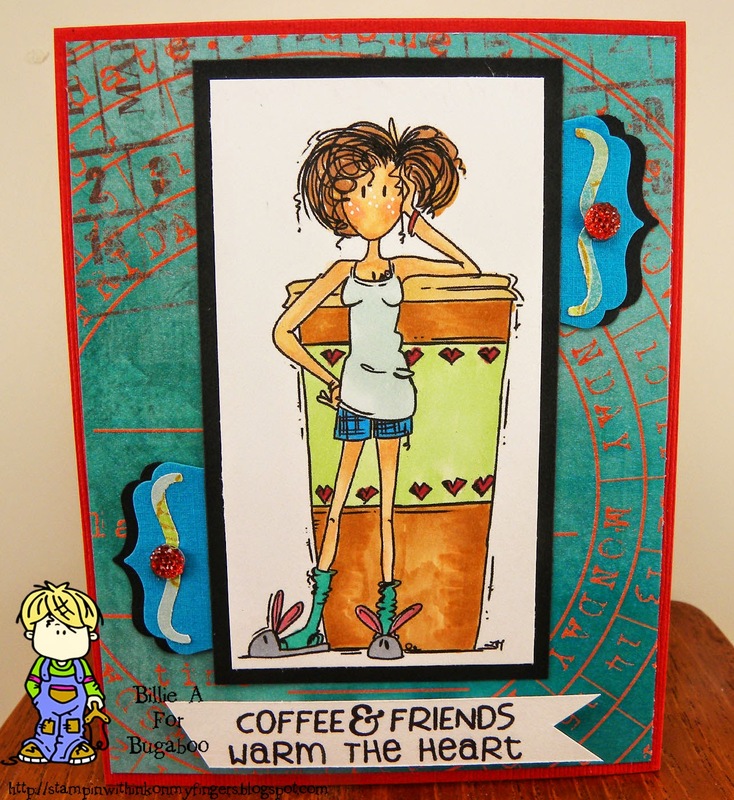 I like hot, blended, iced... Just make it coffee..
today is New Release Tuesday at Catch the bug / Bugaboo and we have Coffee girl. I had so much fun coloring and making this card. I love the image she is so cute and those bunny slippers are just too cute. I kept the card simple, I thought it was missing a little pow so added the little tabs to the side and a little bling. Over all I am pleased and like the color choices. Thanks for stopping by and hope you head over to Bugaboo and check out the images. Happy Monday... Yea I know it's the start of the new work day / week but you have to appreciate that you have Monday to start your new week. It is what you make it. I am going to make mine HAPPY. 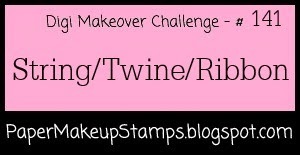 Today is a new challenge at Paper Makeover #141 string/twine/ribbon.. Lets see one or more of those on your card. Use a digi and if your looking for some great digi images check out the PMO store. This is the card I made using the theme above. Her name is Kirsten fairy by digi paper makeover. I love her boots. I have similar boots.. I thought the background paper kinda looked like the dandelion flower. I used some ribbon and a piece of twine to attach the tag and stamped Wish in stazon. Kept the card simple. 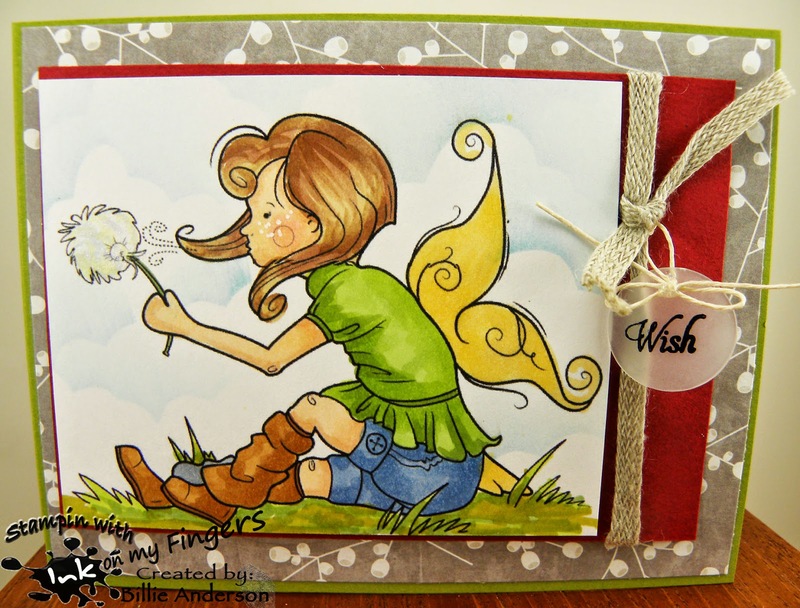 recipe: Kirsten fairy/pmo, we are memory keepers dp, su green, club scrap, ribbon, twine, pti tiny tag wish, wink stella glitter pen, copics, ranger, my cloud template. 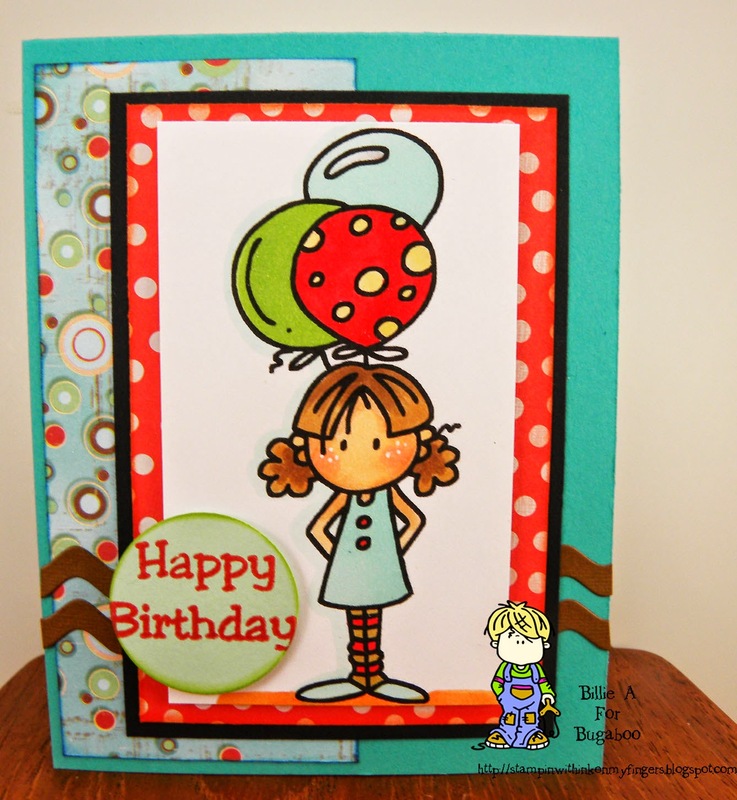 I used WO Balloon girl and some awesome papers to make the sketch card above. 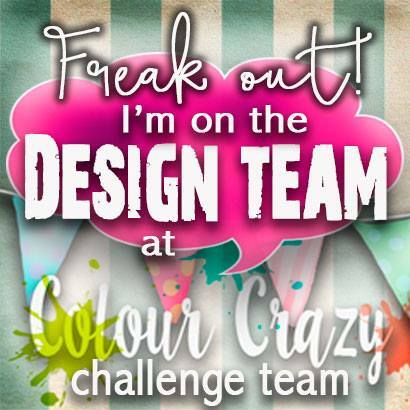 I hope it inspires you to play along and link to the CTB challenge. Unscripted Sketches #257 challenge. I hope you play along and make a card/scrapbook page/project of some sort. Just play along and have a fun. This is the card I made using the sketch above. I really - really had a great time making this card. I had some left over scraps of SU papers from a project my bf and I used at retreat making some cards/envelopes. So I grabbed those and made this card. I love this look and the happiness of the card. I layered the Happy so it was not so flimsy. 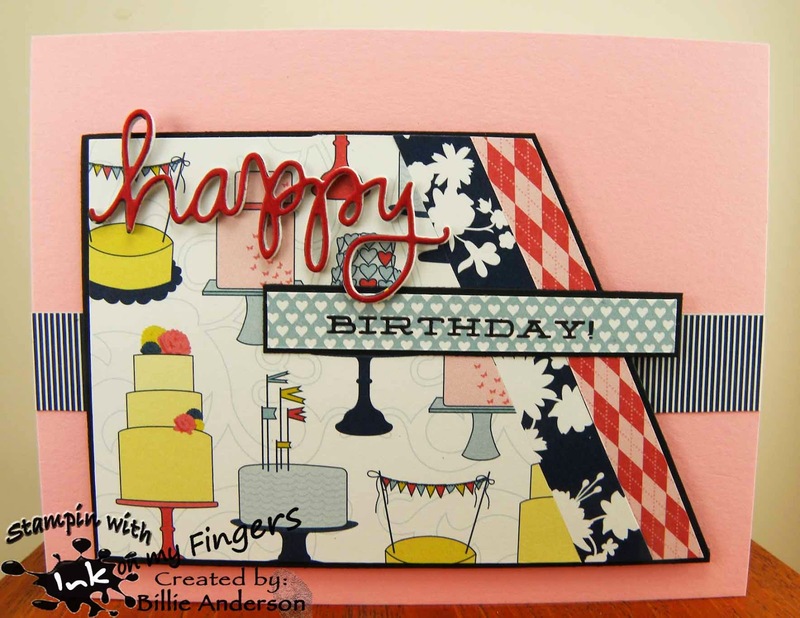 recipe: su pink, su dp, simon says happy die, simon says love this birthday sentiment. This is my card.. yea I know it's past mother's day but I love the image and I guess I could of chosen a different sentiment but I did love this for mother's day and it's ready for next year. I used the image Make it snappy Kidz mother day girl. I took my su "it's beautiful" wheel and perfect plum su ink did the background and added some white pen on a few of the flowers and spot. I used copics to color her and the bg brad and ribbon to give a nice touch. recipe: kidz/bugaboo, kraft, su wheel, su ink, ribbon, bg brad, white pen, wink of stella glitter, su purple, copics. Catch the bug / Bugaboo - Free Friday / Love Ya! hope you get a chance to download this card. It's over at the CTB site and should be posted now. If it's not please check back later as sometimes life gets in the way.. you know how it is.. We aim to please but life gets in the way. recipe: bee bear/bugaboo, kraft, dcwv scraps, doily, su die, mft die, glitter, embossing powder, ss talk bubbles words. 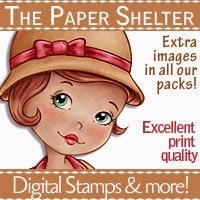 I got the pleasure of using GOOD GIRL by The Paper Shelter. Isn't she cute. I love the little dog and they can be your best friend, mine is. So that is why I used this sentiment. I hope you get a chance to play in the challenge. You have till next week to enter your card. I love seeing what you come up with. 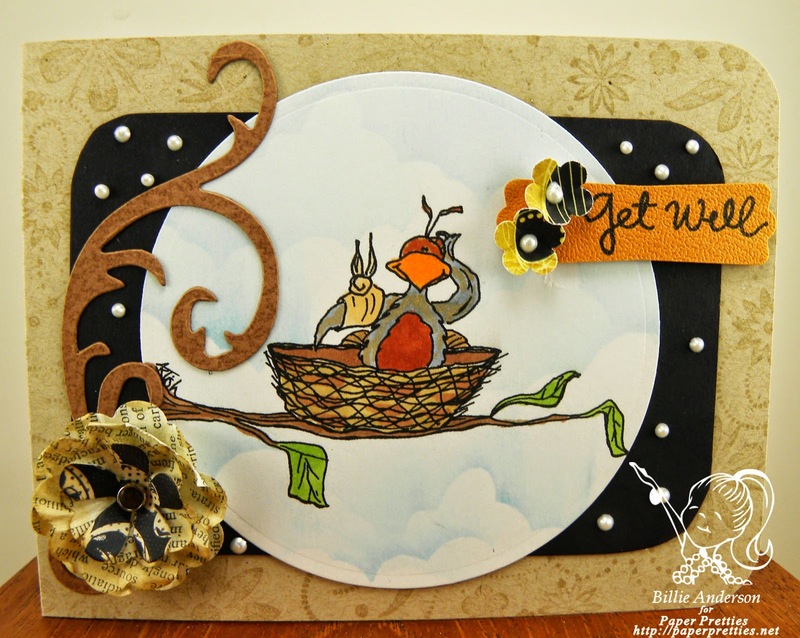 This is the card I made using the image OH feathers . He's got a wounded wing so made a get well card. 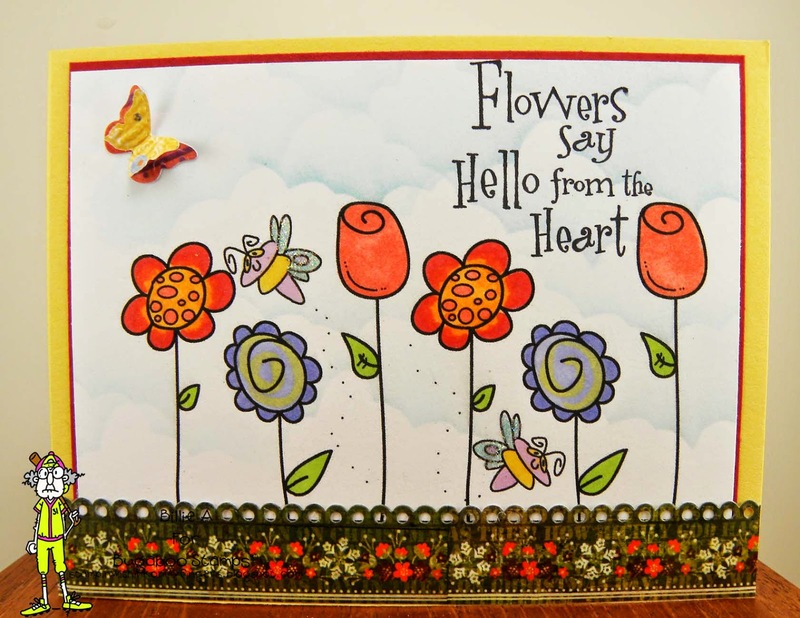 I used some embellishments --a swirl, flower, punch little flowers, a punched sentiment tag and viva pearl pen drops. Fun card. 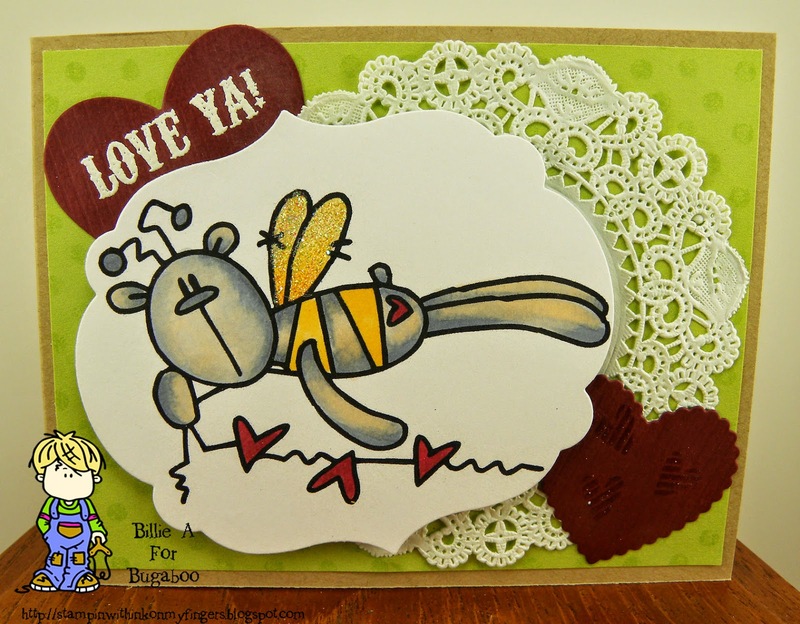 New release day at Catch the bug and another Bugaboo image.. MAY WORD this is the card I made using the May image. I love the bright cheerful colors I chose and the touch of yellow peeking out from the side. It just was missing something and so I embossed a strip of yellow and added it. I like the look. 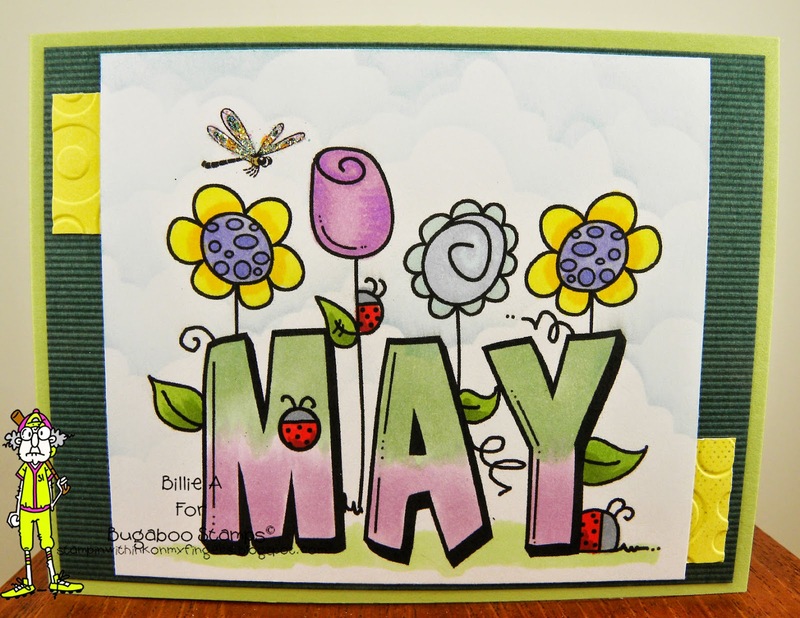 Fun card for that May celebration. Would of been great for a mothers day, birthday... who knows. 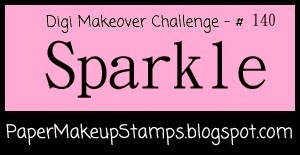 Paper Makeover #140 Sparkle challenge / Thinking of you! I hope you get a chance to play along and show us your sparkle. Make sure you use a DIGI for this challenge. This is the card I made using Celeste the moon digi image and some star die cuts and lots of stickles, plus the designer paper has sparkles already on it. Love that it kept with the moon night scene. First off Happy Mothers day to all of you that are blessed to be a mom, that special someone in your loved ones lives. Hope your day is blessed. You know that you can turn the sketch as I did and make a card, scrapbook page, some project that kind of follows the sketch. Just have fun. This is the card I made using the sketch. Last weekend I went to a ladies church retreat at Seaside Oregon and had a wonderful time. We had some free time during the day Saturday so my dear crafting / BF went shopping to this craft store we always go to when we go to retreat. I got this great seabird. I knew I had to use it. So I die cut the bird, found a lovely sentiment that I received from my oldest BF that passed away some years ago. She loved the sea and it was perfect. I did not have a seabird foot so I drew one.. sorry for the funky look. 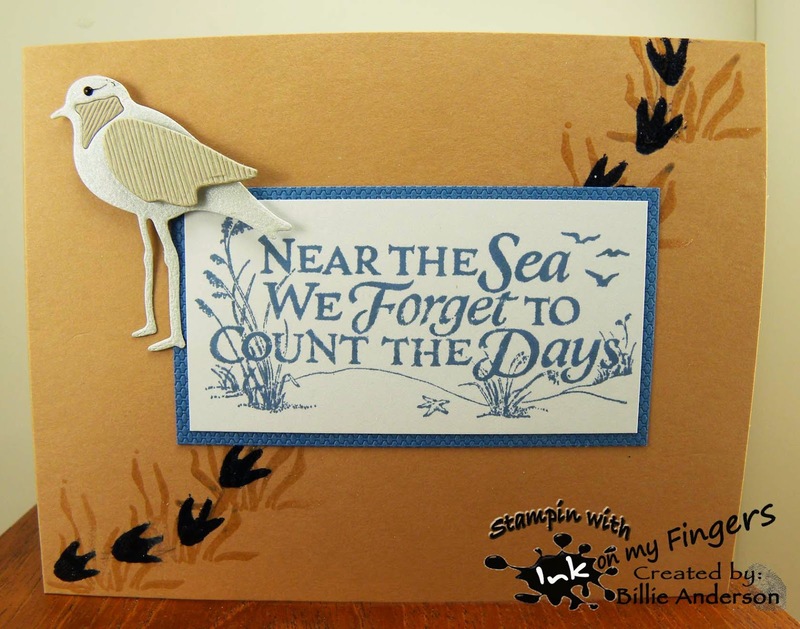 I added some sea grass that I just clear embossed to give the hint of grass. 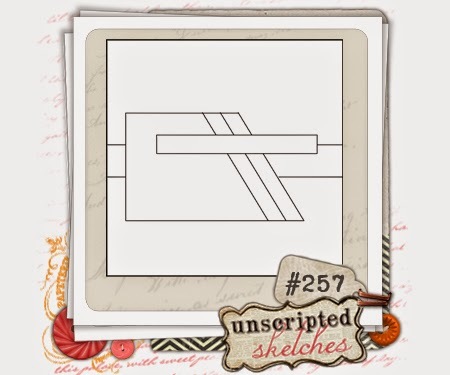 I hope I inspire you to play along and post your card at Unscripted Sketches. Saturday at Catch the bug theme is Pick up / Get Well. Isn't she a hoot, I love this image and sentiment. Sure to bring a smile to that sick one and relate to the gown.. 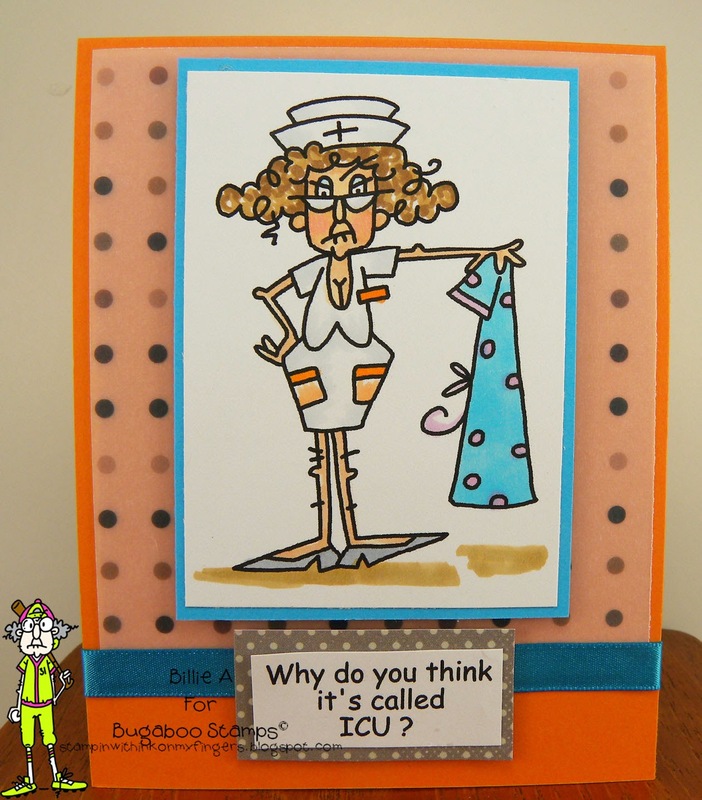 They are the most ugly gowns ever made and for sure lots of air condition hence the ICU. Last year I had 4 surgeries (two were combined) and was in the hospital and had to wear one of these gowns. I always had to make sure I was covered when turned on my side.. or it was ICU..
Wow finally Friday woo hoo hope everyone has a great mothers day and get to spend time with family. Today is Free Friday at Catch the bug we have Fun Flowers so that means you can get this awesome image and it would make a great Mothers day or that Special someone in your life card. Hope you head over to Catch the bug and grab this image. I had this fun paper tape that I added to the bottom, I colored the flowers with a lot of color and those cute little funny butterflies. I added the die butterfly fill that empty space since I added the sentiment where I added it. I used Grumpy Gertrude PMS & GPS I love this sentiment. I have those days and I think we can each relate to this. 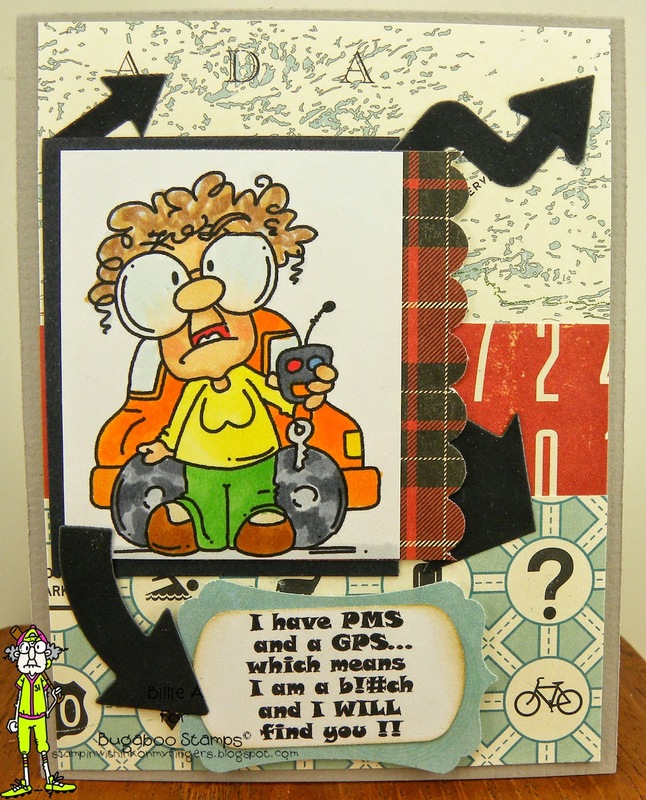 I had fun putting this card together and loved using the arrows as if she's looking for that person..